Am yet to work out how to get the photo to appear at the bottom of the post. Blast. 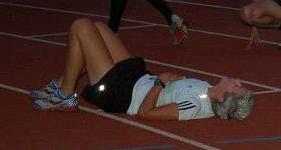 Oh well, here I am at the end of the track 5k I describe below! Hello! Yes, it’s Friday. Thought I’d post today as I actually have something to say and also I won’t be able to do my usual Sunday post as I will be rolling about in the sand at Yellowave attempting to play beach volleyball with the Arena crew. Firstly to catch up. On Wednesday it was the usual downs run. Although it had been a pretty miserable, wet and windy day when we arrived on the top of the downs, though looking ominous, it wasn’t raining. It was pretty dark and windy though. But, hardy souls that we are, we set off unperturbed into the gloaming (think that actually means fog but it sounds good…). We took a different route to previous weeks, not that this made any difference to me as I never know where we are or where we are going but just follow. In the end we did around 7 miles at a speedier pace than last week. Battling the wind across the cliff tops and struggling up hills it was a good run though I could have done with it ending a mile sooner as I was properly knackered and it was getting dark and visibility poor. It was a good run though and was pleased to have got out. On Thursday it was cats all day and then a 5k track race in the evening. Never having done such a thing before I was apprehensive. Though knowing my love of track I thought it might be OK as track pacing is something that I am better at than road, trail etc. This proved to be the case! The 10k and 5k option started off simultaneously but with the 5kers setting off from the 200 metre start. There was one other girl there who was hoping for 21 ish minutes so I stuck with her for the first two laps to stop myself going off like a rocket in the traditional unhelpful style. This worked well as I felt fine so passed her after the two laps and tried to push on slightly whilst remaining cautious and trying to remain consistent on each lap. I had brilliant support from Lydia who had very kindly offered to lap count for me who shouted out my times (no use really as I had no idea what I should be running) and encouragement from the 200 metre start point. Cathy, Fiona and John were also lap counting on the finish line so there was good support throughout. We even got a bell on the last lap! Ready for the stat bit? OK. Lap times as follows: 1.37, 1.40, 1.38, 1.40, 1.40, 1.38, 1.42, 1.39, 1.39, 1.33, 39s (last 200) = 20.21(ish). Amazingly consistent!!!!! Forcing myself to start sensibly with the 21 minute girl definitely helped. Very pleased with this run. A 15 second pb. I had a small wobble where I felt I should have been faster as all my other 5k times are from Hove Park which is hilly so this should have been faster but managed to dismiss the “should haves” after only a short contemplation. Taking the positives it was a consistently run race, I felt fine, I (as usual) felt I could have pushed for home earlier so therefore had more to give, and generally felt I had run well for once). As darkness drew in and the floodlights failed to light the 5kers watched the lone figure of Richard speeding round and round for the 10k. He was the only one to complete the longer distance and romped home in an impressive 32.05 in the almost complete darkness. All in all this was an excellent introduction to long distance track racing and I feel more encouraged about my ability. I do love track but need to work on not becoming so ridiculously anxious in track races. Yesterday’s race was a very low key affair arranged by Tom and a small group of Brighton & Hove ACers as a birthday treat to themselves which I had the honour of being invited to. Now I have finally dared to go and enjoyed it it will be a permanent fixture in my racing diary!